Although many people are looking to buy a budget Chromebook as a cheap computer. There are also many higher end models that will rival the performance of Windows and OSX based laptops. Some of these higher end Chromebooks are even supported by Google to run Android apps in the Google Play store. Using Android apps on a Chromebook is one reason someone might get one of the more higher end models. These are the Chromebook models most likely to support Android apps natively. For example, the Chromebook Pixel 2 was previously mentioned in the “Best Google Play App Support” category but it also in this category as a premium Chromebook. Chromebooks are most commonly made by lenovo, ASUS, Acer, Dell, Samsung, Toshiba, and HP. 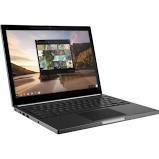 Most of the manufactures also make cheaper Chromebooks that are capable of doing many basic Internet and computing tasks. Higher end Chromebooks typically have better displays and faster processors. This can make a difference when viewing video content, using Adobe photoshop in Chrome, or Skyping on a Chromebook. Another benefit of a premium Chromebook is more RAM. This will help users have more browser tabs open and can run more Android Apps at the same time. Many Chromebook users may not need all this functionality and could be better sticking to cheaper budget Chromebooks. The HP Chromebook 13 G1 sports an Intel Core M Skylake processor powered by up to 8GB of RAM. This is a very powerful processor and lots of RAM. To further make this Chromebook a winner, the battery is very strong and can run almost 10 hours with full productivity. 13.3″ 3200 x 1800 Glossy IPS Display. $499: Intel Pentium 4405Y. 4GB RAM. $599: Intel Core m3-6Y30. 4GB RAM. $819: Intel Core m5-6Y57. 8GB RAM. Intel Core m7-6Y75 with up to 16GB available customization available on HP’s website. 32GB eMMC Storage. Flush Micro SD Slot. Has the option of a USB-C docking station for connecting to an external display. There are no touchscreen options for this Chromebook. Overall a solid 13 inch Chromebook. With an ultra-thin and durable brushed anodized aluminum chassis, the HP Chromebook 13 G1 certainly looks nice. Dell has slowly gotten into the Chromebook Manufacturing Game. Prices can vary dramatically and the Dell Chromebook 13 is certainly pricier than the many “$300 or below” Chromebooks out there. It might be worth it to pay that extra money because you get a 13.3-inch Full HD display and a more premium looking metallic chassis. The processing package ranges from an Intel Celeron up to a Intel Core i3-5005U, with 4 to 8GB RAM, and 16 to 32GB storage. 13.3″ 1920 x 1080 IPS Display. $429: Intel Celeron 3205U. 4GB RAM; 16GB SSD. $529: Intel Core i3-5005U. 4GB RAM; 16GB SSD. $629 Touchscreen Option w/ 32GB SSD. $649: Intel Core i3-5005U. 8GB RAM; 32GB SSD. $629 Touchscreen Option. $799: Intel Core i5-5300U. 8GB RAM; 32GB SSD. $899 Touchscreen Option. Flush Micro SD Slot. Upgradeable SSD. Magnesium-alloy body. Carbon fiber lid. Great build, great display, and every configuration is at a reasonable price. The Dell 13-inch Chromebook is designed beautifully for business-class performance and very fast internet access to all your files in the cloud. The Acer Chromebook 14 is a step above the lower end Acer Chromebooks and brings a bit more of a premium feel to the table. The Acer Chromebook 14 has a brushed aluminum lid, weighs a solid-feeling 3.42 pounds, and has a great display. It is priced slightly above $300 making it a good Chromebook, but still not breaking the bank for one of the lower end models. $349: Intel Celeron 3855U. 4GB RAM. 1366 x 768 TN Display. $499: Intel Core i3-6100U. 4GB RAM. 1366 x 768 TN Display. $599: Intel Core i3-6100U. 8GB RAM. 1920 x 1080 IPS Display. $749: Intel Core i5-6200U. 8GB RAM. 1920 x 1080 IPS Display. Aluminum body w/ spill-resistant keyboard. Customizable Gorilla Glass 3 lid. This Chromebook is ready for business! (It even has a built-in busines card holder!). The nice thing about the Acer Chromebook 14 is its 12 hours of battery life. The solid construction makes them very resilient, including spill-resistant keyboards, top covers encased in tough Corning® Gorilla® Glass and chassis that can handle up to 60 kg of downward force and drops from heights of 45 cm. The Acer C910 has a large 15.6-inch display and is for situations when you might be sharing a screen with someone. Knowing that students can be especially harsh on their devices, the Acer C910 Chromebooks were designed with extra durability features. The higher-end version of the Acer Chromebook 15. It’s still all-plastic and definitely the least premium Chromebook in this category, but so far Acer makes the only 15″ Chromebook and they’ve fitted it with good performance. The screen is decent, too because the Acer Chromebook 15 C910 is the world’s first Chromebook with a 15.6” Full HD1 wide viewing angle display. The Lenovo Thinkpad 13 is designed to balance mobility and productivity . It passes many durability tests , yet it’s still lightweight and features a battery that lasts a full work day. $429: Intel Celeron 3855U. 4GB RAM; 16GB eMMC. 1366 x 768 TN Display. Display. $559: Intel Core i3-6100U. 4GB RAM; 16GB eMMC. $889: Inte Core i5-6300U. 8GB RAM; 32GB eMMC. Add $80 to any configuration for a 1920 x 1080 IPS Display. 1920 x 1080 IPS Touchscreen model COMING SOON. This Chromebook has the durability and performance to match Lenovo’s Thinkpad line. ThinkPad users who what to use ChromeOS over MacOS X or Windows 10 will not be disappointed with this Chromebook. Further, you can install Windows on the Lenovo Thinkpad 13 Chromebook if you change you mind.